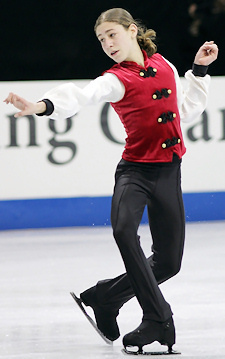 Jason Brown, 15, performs his long program to Tchaikovsky's Pax de Deux at the 2010 AT&T U.S. National Figure Skating Championships. It was a victorious night for Jason Brown, who held off a valiant effort from silver medalist Joshua Farris to take home the gold medal and the title of U.S. Junior Men’s Champion. Brown, a full-time public high school freshman, skated a sensitive program to Tchaikovsky’s Pax de Deux from the Nutcracker, landing seven triple jumps along the way. Brown finished second in the freeskate behind Farris, but still managed to earn the second highest score for a U.S. Junior Men’s Champion since the inception of the new judging system in 2006. His total of 195.22 points edged out Farris by .19 point. Farris rebounded after an uncharacteristically mediocre short program to win the freeskate with the best technical performance of the evening. Farris was the only competitor to land a triple Axel in the competition, and the silver medalist was happy that he was able to recover from an off-season injury to land eight triple jumps in total. Farris earned a total of 195.03 points for his routine to Warsaw Concerto, making this competition the closest in U.S. Junior Men’s history. Finishing in third place with the bronze medal was Max Aaron, the leader after the short program. Aaron skated well in his Concierto de Aranjuez program, landing seven triple jumps plus a credible triple Axel attempt, but was unable to keep pace with his younger competitors. The bronze medalist earned 191.86 points in the competition, and was excited about what his medal winning performance could bring him in the future. Scott Dyer moved up one place to finish with the pewter medal with the best performance of his young career. The eighteen-year-old was credited with only four clean triple jumps, but he earned the highest component scores of the evening which helped him to stake claim to the podium. Finishing in fifth place was eighteen-year-old Alexander Zahradnicek with 168.64 points, while Austin Kanallakan slipped from third place to sixth in his fifth attempt at the junior men’s title.